55 Broadway is the historic headquarters of London Underground, built between 1927 and 1929, and encompassing St. James’s Park station. The building features a series of sculptures on the facade by leading artists of the day. The design of the building by Modernist architect Charles Holden was cross shaped in plan, with wings at the north, south, east and west. 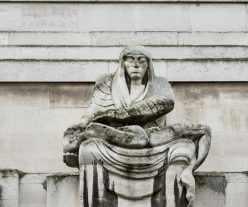 Eight sculptures at high level are intended to reference the ancient Greek Tower of the Winds in Athens, with two carved reliefs for each wind by Wyon, Gerrard, Gill, Aumonier, Rabinovitch and Moore, in his first public commission. A smaller version of Gill’s ‘North Wind’ is now part of Tate’s collection, on display at Tate Britain. Two further sculptures sit just above street level on Broadway – ‘Day’ and ‘Night’ by Epstein. They were considered deeply avant-garde in 1929 and were heavily criticised in the media for being indecent. Epstein is a pivotal figure in Modernist sculpture, and his approach at 55 Broadway, carving directly into the facade and taking inspiration from ‘primitive’ art, was widely embraced throughout the later twentieth century. 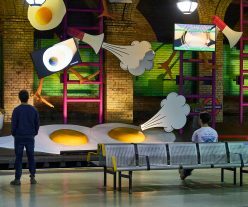 Art on the Underground’s programme for 2019 will comprise of major new works from internationally renowned artists. As we approach the prospect of the UK leaving the European Union and edge towards an uncertain future, the 2019 programme will explore what it means to be ‘on edge’, individually, collectively, politically and socially. 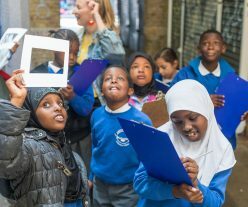 The 2019 programme will look at the role artists can play in developing utopian ideas of togetherness and belonging. 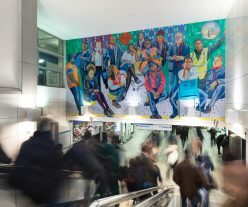 For her first UK public commission, Aliza Nisenbaum will be in residence at Brixton station for two months, painting Transport for London staff. 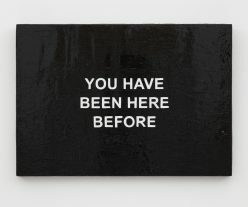 Laure Prouvost will create her first public commission in the UK, an ambitious city-wide series of signs and slogans, infiltrating all 270 London Underground stations and seen by millions of people each day. Denzil Forrester will reinterpret his seminal painting ‘Three Wicked Men’ from 1982 for his first public commission in over three decades. 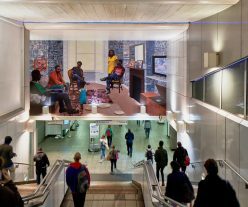 Larry Achiampong will re-imagine London Underground’s iconic logo, the Roundel, in a configuration of his ongoing series, the ‘PAN AFRICAN FLAG FOR THE RELIC TRAVELLERS’ ALLIANCE’. Nina Wakeford will present her two-year research project alongside the new Northern Line Extension programme in South London. 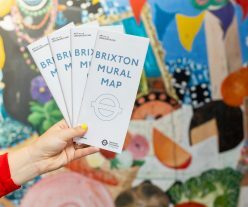 For the Pocket Tube map, Bedwyr Williams will create one of his iconic drawings which merge art and life with a comedic twist. The construction of the Victoria line began in the early 1960s, with a uniform clean design for each station. 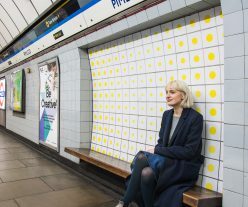 Individual character is brought into stations by a unique tile design sitting behind benches on the platforms. 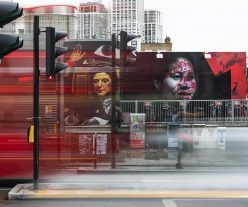 At Pimlico station, it was decided that a contemporary artist would be appropriate to link the station to the Tate Gallery (now Tate Britain), just a few minutes walk away. Peter Sedgley was chosen. In the 1960s, Sedgley was developing his ‘op-art’ style of work, optically confusing artworks that challenge your perceptions. 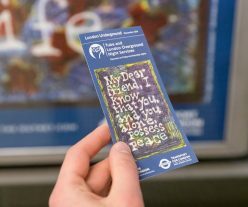 He based his design at Pimlico on his painting ‘Go’ of 1968. Many of Sedgley’s works can be found in Tate’s collection. Other bench recess designs along the Victoria line feature work by designers and graphic artists Abram Games, Edward Bawden, Hans Unger, Alan Fletcher, Tom Eckersley, George Smith and Julia Black.